The Cavallo Trek Hoof Boots are extremely lightweight boots which have high durability due to the rust proof metals, waterproof threads and high performance TPU outsole. The built in sole absorbs shock over a variety of terrains and takes pressure off the bar, sole and frog, while the moulded back-flap offers maximum bulb protection. The slim boots are 1/4 inch narrower than the regular fit. Below are some recent questions we've received regarding Cavallo Trek Hoof Boots, including answers from our team. Can these boots be worn over shoes for turn out? Cavallo boots are designed to be used over the bare hoof while riding, but they do have horse owners using them very successfully over their horse’s metal shoes for extra protection and shock absorption. The boot they recommend for turnout use is the Trek boot. To measure a shod hoof for boots you will want to measure the length of the hoof from the farthest back points of the shoe to the toe and the width right across the widest part of each hoof. Measuring after a fresh trim is always best. Please note that using the boots over a metal shoes does void the manufacturer’s warranty. 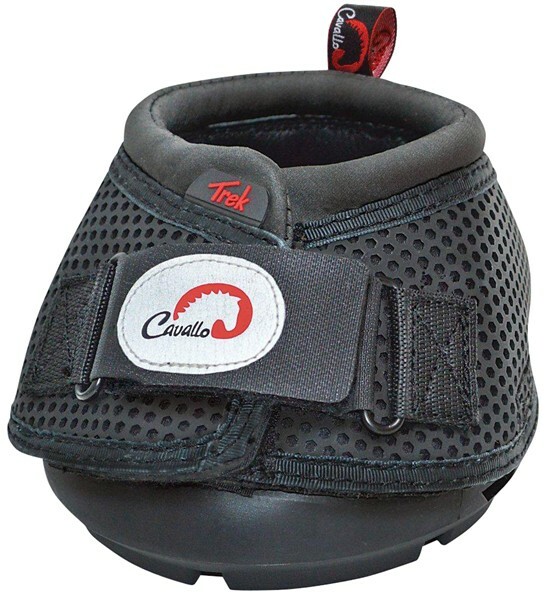 The Cavallo Trek Hoof Boots are sold in singles.